Copyright: © 2016, Mancini M, et al. This is an open-access article distributed under the terms of the Creative Commons Attribution License, which permits unrestricted use, distribution, and reproduction in any medium, provided the original author and source are credited. Nearly more than one hundred men and women with massive obesity have been admitted to our clinical unit for the administration of a 6-8 week extremely low calorie diet (300 kcal). Treatment was well tolerated, and led to a weight loss of about 20 kg body weight in men and 15 kg in women. Cardiac, respiratory and orthopedic complications of severe obesity were gradually attenuated with a progressive decrease in the need for hypoglycemic, antihypertensive, analgesic and diuretic drug administrations. This treatment proved to be particularly useful in preparation to bariatric surgery and for improving complications of severe obesity. Calorie restriction in humans, up to total fasting, was first described by Luciani at the end of 1800  and then few years later by Benedict . Subsequently, Keys published two valuable volumes on human starvation . In the midtwentieth century, drastic calorie restriction used to be proposed for the treatment of massive obesity by various authors [4-6]. Due to the increased prevalence of obesity with severe medical complications, many years ago we began hospitalizing patients with massive obesity to administer dietary treatment based on severe calorie restriction, from 80 to 300 kcal derived from protein rich food [7-12]. Unfortunately, this type of treatment became incompatible with budget restrictions imposed by the Italian national health care system. More recently, the regional health care system has reinstated coverage of hospitalization costs up to 60 days. Consequently, since February 2014, we again began treating severe obesity in a private hospital in Naples, with a 300 kcal protein-rich diet . Here we report the results obtained by applying the same methodology to a significantly larger number of very obese patients, in order to provide further evidence of the efficacy and safety of this particular dietary treatment for severe obesity. We have hospitalized so far 105 patients (63 women, 42 men) with massive obesity (BMI over 40). All of them had variable degree of respiratory insufficiency with abnormality of blood O2 and CO2 and need of baro-volumetric mechanical aids for nocturnal respiration. Arterial hypertension was found in more than 80% of cases and diabetes in about 50%. Kidney failure was observed in nearly 30% of them and in about 20% cardiac failure was detected from class II to IV NYHA. Almost all patients had painful arthralgias of variable severity involving the lower limbs and spine. The patients are under strict medical examination, with weekly check-up of routine blood chemistry and resting ECG. Body weight is controlled at two-three day intervals. During the day the patients are invited to walk, according to individual possibilities, either in the corridor out of the wards or, if possible, in the ample hospital park. Moreover, once a day, expert physiotherapists dedicate at least one hour to a personalized treatment of each patient. The diet includes a morning serving of tea or coffee without sugar; broth with boiled vegetables at lunchtime; a portion of 150 g of meat or fish with fresh and/or boiled vegetables at dinnertime. Bread, sugar, oil or butter, fruit, and alcoholic beverages are not allowed. All the patients are encouraged to drink at least two litres of fresh water per day. The composition of this 300 kcal diet consists of 56 g proteins (72%), 13 g carbohydrates (15%), 4 g fats (13%), 11 g fiber and 2.5 g K+ (64 mEq). Because this amount of daily K+ intake is lower than the daily need of 3.9 g (100 mEq) for adults of both sexes, 30 mEq of potassium are administered per os every day, together with a multivitamin pill. This dietary treatment is preliminarily well explained to patients for their consent and further collaboration. The daily consumption of little more than 50 g of proteins, according to our previous experience , is sufficient to compensate the daily nitrogen loss. This regimen has always been well tolerated, without any major complaint, since appetite is initially attenuated and then suppressed by increased ketone production induced by caloric restriction . The results are almost always rewarding because weight loss is remarkable, especially in young male patients. Furthermore, we observed an improvement of mood and vitality in all treated patients. The effects of this treatment on our patients’ body weight are summarized in Table 1. 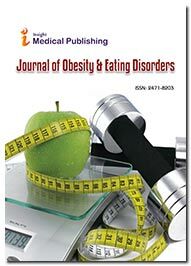 In male obese patients a weight loss of about 20 kg was obtained in little over 6 weeks of drastic calorie restriction; in obese women a loss of nearly 15 kg was observed with the same type of treatment. Table 1: Effect of an extremely low calorie diet (300 kcal) in obese patients admitted to a metabolic ward. Data are reported as mean ± s.e.m. The p value refers to the comparison of Weight 1 vs Weight 2 and has been calculated with both paired T-Test and Wilcoxon test. With loss of body weight, respiratory and cardiac functions ameliorate together with walking ability, nocturnal sleep and general metabolic conditions. Hyperglycemia, hyperlipidemia and hypertension, often present, are normalized. Joint pain affecting the lower limbs and spine substantially ameliorates together with a gratifying sense of wellbeing. Consequently, almost in all patients on drastic calorie restriction, a progressive decrease in the need for hypoglycemic, antihypertensive, analgesic and diuretic drugs is observed. This outcome is particularly useful for patients candidate to bariatric surgery because their surgical risk significantly decreases. Indeed a large majority of obese patients requiring drastic calorie restriction is referred to us from their bariatric surgeons, for the preparation to their surgical intervention. Concomitantly, in addition to patients awaiting bariatric surgery, more and more frequently various city hospitals refer to our unit patients with massive obesity and severe cardiac, respiratory and orthopedic complications. These patients, generally middle aged individuals present such severe clinical conditions as to require meticulous medical assistance, with continuous maximal care from physicians, physiotherapists, and nurses. Our drastic dietary regimen induces general improvement even in the presence of severe clinical conditions, along with reduced dosages of diuretics, antihypertensive and hypoglycemic compounds. However, not always is it possible to avoid sudden worsening of the patients’ clinical conditions; in such instances, these patients are urgently transferred to the emergency unit of the near city hospitals. Unfortunately, from February 2014 to December 2015, out of little more than of 100 massively obese patients of both sexes admitted to our unit, five patients died in our ward despite all the possible intensive care we could provide. A painful outcome, but unavoidable when massive obesity is of long duration without any possible attempt to lose weight. Evaluation of the possible causes of death without necroscopy is obviously problematic and hypothetic. Examination of the clinical records suggests that death may have occurred for severe respiratory failure in one patient, for acute kidney failure in another one, and for cardiac failure in three other cases. A third category of subjects admitted to our unit consists of obese people without severe complications and psychiatric problems, possibly with type 2 diabetes and/or hypertension and/or painful lower limbs or spine osteoarthrosis who have excluded bariatric surgery and have decided to lower their body weight with our dietary regimen and physiotherapy. Also in these patients, we achieved rewarding results, with satisfactory weight loss and lower consumption of drug therapy. Periodical bimonthly re-examination shows that weight loss is maintained, at least for one year after discharge from our unit, with the prescription of a 1000 kcal diet, confirming our previous experience . As already mentioned, the treatment of obesity by means of drastic calorie restriction was well tolerated by all our patients. It should be underlined, however that in three female patients treated in the past [7-12], out of a series of more than 300 cases, atrial fibrillation took place but was easily converted to sinusal rhythm by intravenous infusion of KCl and 5% glucose solution. In the present series of patients a 75-yr old female obese patient, during the third week on the 300 kcal diet presented atrial fibrillation, resistant to glucose and K+ infusion, which required electrical defibrillation in a specialized cardiological unit. A sort of cardiac “irritability” during fasting regimen is mentioned in Luciani’s historical publication: in fact, a tendency to arrhythmia with sporadic cardiac extra beats in human starvation was reported . In massive obesity, a condition that notoriously predisposes to arrhythmia due to heart enlargement , potassium supplements may not be sufficient to minimize the risk of this condition during drastic calorie restriction. Moreover, a possible deficit of some minerals, such as cadmium  or selenium , which have a physiological role in myocardial contractility, has been indicated. Another possible explanation for atrial fibrillation in obese patients who are rapidly losing weight is their increasing physical activity which might raise the adrenergic signal to atrial pacemakers. The average basal heart rate of our patients was actually 95 bpm and beta-blocking agents might be a reasonable choice to prevent the early effects of mobilization in some obese patients. However, atrial fibrillation was present in 10% of our patients at admission in the metabolic ward, thus confirming that this arrhythmia is a natural complication of obesity. In conclusion, drastic calorie restriction to nearly 300 kcal per day, in massive obese hospitalized patients, is a useful treatment in preparation to bariatric surgery and to improve severe clinical complications often resistant to exclusive drug therapy. Attention should be paid, particularly in the early phase of weight loss, to high heart rates in order to reduce the spontaneous risk of atrial arrhythmias. The study protocol was approved by the local medical research ethics committee. The authors are obliged to Dr. Angela Giacco for the calculation of diet composition and to Mr. Salvatore Carotenuto for collecting the clinical records of the patients studied. Luciani L (1889) Fisiologia del Digiuno. Firenze: Le Monnier. Benedict FG (1915) A study of prolonged fasting. Washington: Carniege Institution. Keys A, Brozek J, Henschel A, Mickelsen O, Taylor HL (1950) The Biology of Human Starvation. Minneapolis: University of Minnesota Press. Duncan GG, Kerson WK, Fraser RI, Cristofori FC (1962) Correction and control of intractable obesity. JAMA 181: 309-312. Drenick EJ, Swendseid ME, Bland WH, Tuttle SG (1964) Prolonged starvation as treatment for severe obesity. JAMA 187: 100-105. Bloom WL (1959) Fasting as an introduction to the treatment of obesity. Metabolism 8: 214-220. Mancini M, Contaldo F, Di Biase G, Scalfi L, Presta E, et al. (1979) Frequency, relevance, and reversibility of medical complications of obesity. Medical Complications of Obesity. Proceedings of the Serono Symposia, London, New York: Acad Press 26. Contaldo F, Di Biase G, Scalfi L, Presta E, Mancini M (1980) Protein-sparing modified fast in the treatment of severe obesity: weight loss and nitrogen balance data. Int J Obesity 4: 189-196. Contaldo F, Di Biase G, Fischetti A, Mancini M (1981) Evaluation of the safety of very low calorie diet in the treatment of severely obese patients in a metabolic ward. Int J Obesity 5: 221-226. Di Biase G, Mattioli PL, Contaldo F, Mancini M (1981) A very low calorie formula diet (Cambridge Diet) for the treatment of diabetic-obese patients. Int J Obesity 5: 319-324. Mancini M, Di Biase G, Contaldo F, Fischetti A, Grasso L, et al. (1981) Medical complications of severe obesity: importance of treatment by very low calorie diets; intermediate and long term effects. Int J Obesity 5: 341-352. Contaldo F, Presta E, Di Biase G, Mancini M (1982) Nitrogen loss and urinary creatine excretion during fasting in massive obesity. Int J Obesity 6: 97-100. Mancini M,Pauciullo P (2015) Drastic calorie restriction in preparation for bariatric surgery. NutrMetabCardiovasc Dis 25: 242-243. De Divitiis O, Fazio S, Petitto M, Maddalena G, Contaldo F, et al. (1981) Obesity and cardiac function. Circulation 64: 477-482. Blackburn GL (1978) Liquid protein diets and protein-sparing modified fast: Correspondence. New Engl J Med 299: 419. Hastings DVM (1978) Liquid protein diets and protein-sparing modified fast: Correspondence. New Engl J Med 299: 420.